Tipu MACD Oscillator is the modified version of the original MACD Oscillator published by MetaQuotes here. Choose two types of signals (Zero Line Cross, and Main Signal Cross). Choose the type of plot (Histogram, Lines, or Both Lines and Histogram). Customizable Buy/Sell alerts, push alerts, email alerts, and visual on-screen alerts. Create your own strategy by adding additional Tipu Panel addon indicators. Add premium Tipu Trend indicator and get more out of the MACD signals. MACD Oscillator was devised by Gerald Appel in late 1970s. It is a momentum oscillator that is calculated by subtracting the two price moving average calculated on the price. MACD Oscillator is one of the most simplest indicator that provides best of both trend and momentum. Zero Line Cross - MACD zero line cross means the two moving averages cross. For example, when MACD crosses zero line from below, it means that the fast moving average has crossed the slow moving average and has moved up (bullish cross). Signal Line Cross - MACD signal line is the simple moving average of the MACD main line and can help signal early change in the trend. For example, when the MACD main line crosses the signal line from below, it means the moving average trend is moving up. This can be used as a buy signal. Convergence/Divergence - Divergence occurs when the MACD indicator directional movement is not confirmed by the price action. 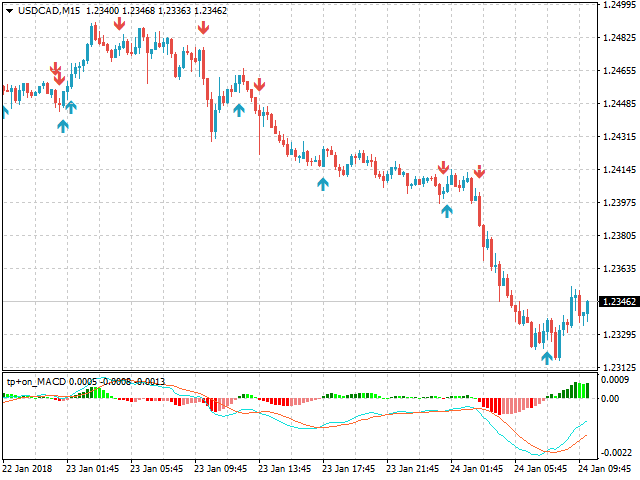 For example, a bullish divergence occurs when EURUSD makes lower low but the MACD indicator makes higher low. This means that EURUSD is losing momentum and a bullish correction is possible. Full description of MACD Oscillator is available here. Main Signal Cross - will generate a trade signal when the main line crosses the signal line. Mark Buy/Sell Signals - choose Arrow or Vertical Lines or nothing. Arrow offset (pips) - (works only if mark the buy/sell signals = Arrow) select value to offset Arrows from high (if sell), and low (if buy). Increasing Arrow Offset (pips) move arrows away from the high/lows. Section#4 - Buy/Sell Global Alert Settings - these settings only affect Tipu Panel and Tipu MACD plot. The alerts for Dashboard are controlled by the settings dialogue of the Dashboard. Alert Shift - candle delay for the signal, enter 1 if you want the alert sent after one candle to be passed. Alert Mobile - select true/false to get a push notification on your device, make sure the device settings are correct here. Alert Onscreen - select true/false to get alerts on the terminal, this alert is shown in a separate window. Alert Email - select true/false to get email alerts, make sure email settings are correct here. Хороший индикатор, многим может быть полезен. Good and the best is that its free!! Excellent, the only MACD indie you will ever need to use. 5 out of 5. This free MACD indicator is amazing. If you want to scalp, combine this indicator with the stochastic. awesome.. esp in combination with the tipu rsi.. only thing I'd wish for is to store customized settings.. recommended! Just like iMACD, but better. Although I am still an Amateur at Forex Trading, one thing that I do know is that the MACD in MT4 platform is total garbage. If you know what MACD does, then you know its a powerful tool. You should totally download this if you know what you're doing. 5 Stars because of clarity and the way it is designed. MACD is not a tool you use to tell yourself, "OH ITS TELLING ME TO BUY I SHOULD BUY A TRADE NOW". NO! You simply use your sense and discipline and patience. Top, 5 star for this indicator.. Thank you Kaleem, excelent indicator! The only thing, it lacks divergence, but that is better to see right in chart. Manufacturer's note; "the panel does not appear automatically, you have to install another indicator called "Tipu Panel". This panel combines all my indicators together. 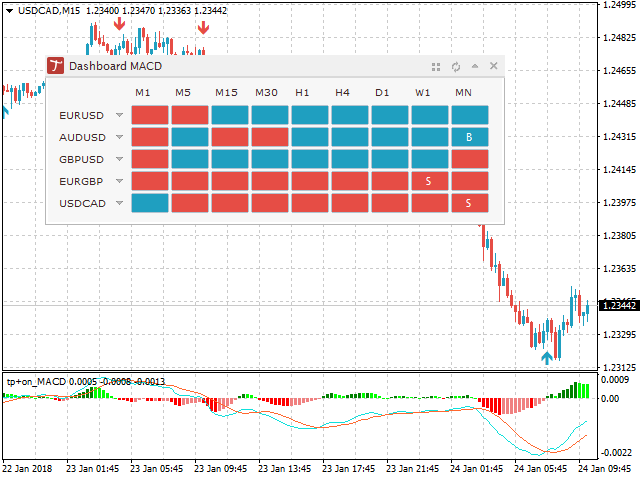 Once you have Tipu Panel added, you will start setting multi-timeframe information for MACD and other Tipu indicators added to the chart. Please let me know if you have trouble getting the panel"
First test - very good, used as supporting indicator for entry in the direction on the main trend. Great job. Wow Kaleem ! Brillant idea. Fixed problem with buy/sell alerts. Added option to enable/disable buy, and sell alerts. Added option to offset Arrows from high (if sell), and low (if buy). Increasing Arrow Offset (pips) move arrows away from the high/lows. Fixed problem with updating arrow. Fixed zero line cross arrow and alerts.